The first Baloch migrants in Russia appeared in the region of Mari in Turkistan, i.e. in the territory which nowadays belongs to the Republic of Turkmenistan. The statistical report on Turkmenistan for 1917 - 1920 mentions 936 Baloch living in the Bayram-Ali district. 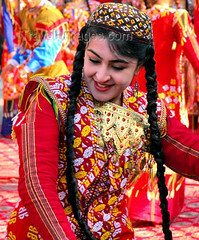 The Baloch of Turkmenistan mostly came from Afghanistan, from the Chakhansur district located in the province of Nimruz, in the Sistan area of Afghanistan. Apart from them there were also a small group of Baloch who migrated to Turkistan from Iran (from Khurasan). In these migrations there were also some Brahuis who came together with the Baloch. At the present time the Baloch of Turkmenistan live mainly in the districts of Bayram-Ali and Iolotan of the region of Mari (Mariyskiy velayat). According to the data of the 1959 census in the USSR, 7 800 Baloch lived in the Soviet Socialist Republic of Turkmenistan, in the valley of the Murghab river, in the districts of Bayram-Ali, Turkmen-Kala and Iolotan, and 94,9 % of them considered Balochi to be their mother tongue. In the 1970 census there were 12 600 Baloch in Turkmenistan, and 91,8 % regarded Balochi as their native language. In the 1979 census there were 18 997 Baloch in Turkmenistan, and 18 633 persons (98,1 %) stated that Balochi was their native language. There are in 1997 probably approximately 38 000 - 40 000 Baloch in Turkmenistan, although some give a higher estimation of around 50 000 or even more. The very strong loyalty among the Baloch to their mother tongue is quite remarkable, and can at least to a certain degree be explained by their rural way of life. A thorough investigation of the socio-economic conditions under which this strong retention of the Balochi language has been possible would be very interesting to carry out. It seems that the Turkmenian Baloch are in great need of help from international organizations and cooperation with Balochi scientific and cultural organizations in other countries. Nowadays, as far as I know, there are no relations either on state level or on the level of organizations. I know only of one incident in the past when there was an attempt at establishing relations between the Turkmenian Baloch and the Baloch of Pakistan. In the mid 1980s the Union of the Soviet Societies for Friendship and Cultural Relations with Foreign Countries invited the Balochistan Provincial Assembly speaker Mīr Muhammad Akram Baloch to Moscow. The USSR - Pakistan Friendship Society organized a trip to Turkmenistan for him. In Ashkhabad he met Baloch students and took part in one of their traditional gatherings. In addition, he visited the town of Tejen, where only few Baloch families live nowadays. He was, however, unable to visit the Mari region where practically all the Turkmenian Baloch are concentrated. After that there were no contacts on such a high level. Mīr Muhammad Akram Baloch's notes about this trip were published in one of Māhtāk baločī's editions. There are no aspirated plosives at all in this dialect. There are no fricatives /θ/ and /δ/ either. The fricatives /f/, /γ/ and /x/ are to be found only in late loanwords. The pharyngeal fricative /h/ is never pronounced, e.g. Asan (Hasan). There is another indicative tense system in most other Balochi dialects, where there are no preterite versus past continuous forms. On the other hand continuous forms are formed with auxiliary verbs, e.g. man rawagā-y-un 'I am going' and man rawagā-y-atun 'I was going' (Rakhshānī Balochi). However, also in the dialect of Zahidan, Iran, this preterite - past continuous distinction is retained. A three case system governs the declension of nouns and pronouns in this dialect. The oblique case which is usual for the agent in the ergative construction is not used in the Turkmenian Balochi dialect, because there is no ergative construction left there. Past transitive verbs are constructed actively: man trā dīstun 'I saw you', brās-ī sarā čandent 'his brother nodded his head', murād watī kitābā pa ammā wānt-ī 'Murad read his book to us', dušman āī dast-u-pādānā baštant 'the enemies tied his hands and feet' etc. Zarubin, Beludžkie skazki, I-II, see bibliography. Note also that there are several articles on the Baloch in Turkmenistan in the May 1957 issue of Māhtāk baločī. For a thorough description of the tense forms occurring in a variety of Rakhshānī spoken in Pakistan, see Barker-Mengal, vol. I. Also found in other Northern Rakhshānī dialects.